German seeding equipment specialist Lemken has unveiled its pre-production Azurit seeder at the recent Agritechnica which unique seed placement concept of staggered twin rows instead of traditional single rows has caught the attention of visitors at the show. 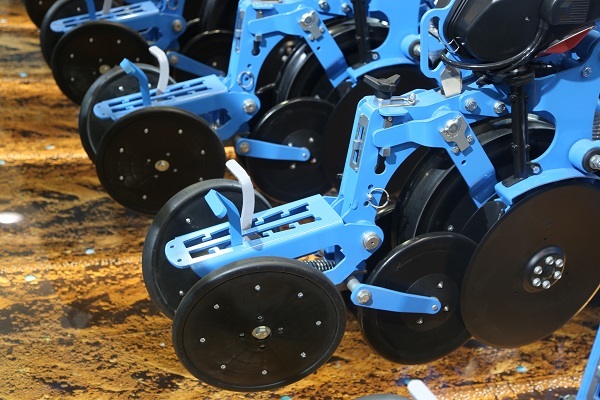 The pre-production Lemken Azurit seeder on display at Agritechnica 2015. The move follows Lemken’s initial announcement at Agritechnica 2013 of its venture into single seed drilling. Lemken claims its DeltaRow concept which places seeds in staggered rows spaced 12.5cm apart will give crops 70 per cent more surface area for growth and ensure better access to water and nutrients. The Azurit is designed for the sowing of maize, soy beans, sunflowers and rapeseed at forward speeds of up to 15km/h. Two residue wheels on the Azurit serves to clear stubble and harvest residue on the ground before a fertiliser coulter places a fertiliser band precisely in the middle between the twin rows. A trailing trapeze packer roller then closes the fertiliser grove and the trapeze rings – which Lemken says is another standout feature of the Azurit- pre-consolidate the furrows. Seeds are then conveyed to the singling units "on demand" from a central seed hopper. The singling unit comprises two synchronised perforated discs which distribute seeds alternately onto the two double disc coulters of the DeltaRow seeding unit. The coulters, which are guided by a depth control wheel installed between, place the seeds precisely in the pre-consolidated furrows. The seed rows are then closed by a V-shaped pressure roller. If necessary, operators can switch off individual twin rows to create tramlines and adjust the Azurit’s application rates to ensure plant populations per hectare remain constant. The Azurit allows rows to be spaced up to 87.5 cm in between, and the distance between the seeding units can be adjusted down to 37.5 cm. The use of two synchronised perforated discs results in each disc singling only every other seed, which keeps the diameter narrow hence minimising circumferential speed. The time interval for the singling process is large enough to achieve substantial improvements in longitudinal distribution and double seeding. Lemken hopes to roll out the Azurit planter on to the market in two years’ time. In addition to the Azurit planter, Lemken also introduced several brand new products at Agritechnica 2015 including what the company claims is the world’s largest compact disc harrow – the Gigant Heliodor. Featuring a width of 16m and the ability to cover up to 25 hectares per hour, the Gigant Heliodor disc harrow has been designed to provide maximum efficiency for large broadacre farms. The machine was unveiled to the public for the very first time at Agritechnica 2015, after completing trial runs on large farms in eastern Germany and North America. Lemken says the company is now ready to launch it into the market. 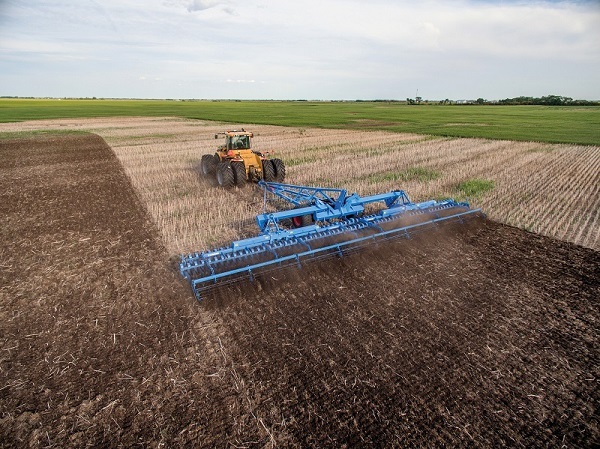 The system consists of a Gigant 12 S system carrier and two 8m Heliodor 9 compact disc harrows, which is also a new addition to Lemken’s product range. Two 4m sections of the Heliodor 9 combine to form 8m units which are then connected to two three-point linkages on the Gigant system carrier. The entire system is then attached to the tractor’s double-clip drawbar via a drawbar eye. Disc diameters have been increased from 465mm on the existing Heliodor range to 510mm on the Gigant Heliodor which Lemken says will not only help prolong disc servicing life but also increase working depth by 2cm to up to 14cm. Self-levelling lower links allow the two Heliodor 9 harrows to independently adjust to surface contours while self-levelling suspension on all the 4m sections allows for optimum adjustment over the full implement’s working width which results in consistent depth control in the field. The three-point linkages on the Gigant 12 S are connected to double-acting control units to ensure optimum weight is transferred from the system carrier to each Heliodor section especially in hard soils. Lemken says this ensures the system delivers consistent and quality work on the field despite its large working width. The entire unit can be folded up into a compact 3.5m for road handling purposes. Lemken products are distributed in Australia by William Adams Ag. Find Lemken tillage and seeding equipment for sale.